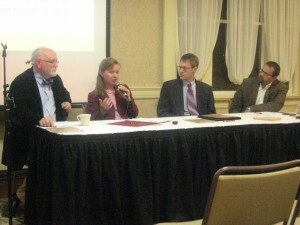 Panelists in the first Heritage Forum included (from left) Mark Norris, Christy Hill, Steven Nolt, and Jared Burkholder. The first of a series of “Heritage Forums” celebrating the 75th anniversary of the founding of Grace Theological Seminary was held last evening, Tuesday, October 9, in the East Room of the Westminster Hall in Winona Lake with four panelists participating. Dr. Mark Norris presented “Reforming Brethrenism: L.S. Bauman and Alva J. McClain” in which he detailed some of the context and activity that led to the founding of Grace Seminary in 1937. Dr. Jared Burkholder who, along with Norris, teaches history at Grace College, presented “A Separatist Creed: Grace Seminary and American Fundamentalism.” Burkholder’s presentation focused mainly on the contributions Herman Hoyt and John C.Whitcomb made to the seminary’s history. Dr. Christy Hill of the seminary faculty presented “Pursuing Piety: Historical Perspectives of Grace Seminary and The Inner Life.” Hill spoke of the balance between head knowledge of theology and practical application, and discussed movements in which Larry Crabb, Ken Bickel, and current president Ron Manahan have been involved. The final presenter, Dr. Steven Nolt of the history faculty at Goshen College, gave a response based on his earlier reading of the three papers and the evening’s discussions. Approximately 40 people attended the first in this series, followed by a time of refreshments and open discussion and fellowship. A second forum will be held in the spring. The presentations were taken from material currently being gathered by Norris and Burkholder for a book commemorating the 75th anniversary of the seminary, placing it and the Grace Brethren movement within the context of American evangelicalism. The book will be published in the spring by BMH Books of Winona Lake.